Graveyards/Cemeteries are spooky which is why the Halloween Graveyard is one of the most enduring Halloween themes. You can decorate both your house and garden as a graveyard, but I think that an outside graveyard is the spookiest option. 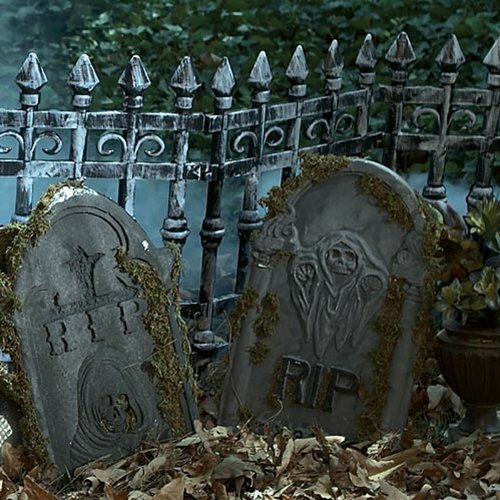 There are lots of different ways in which you can create your very own Halloween graveyard. You can buy a range of different Halloween graveyard decorations or even make your own. You can start off your graveyard with tombstones and crosses and there are certainly lots of props available, but there are so many different options for you to make your Halloween Graveyard stand out from the others. If you want to create the spookiest Cemetery ever (albeit rather ‘traditional’) from skeletons to tombstones and even the grim reaper himself then have a look at this Halloween Graveyard post, but if you want your Halloween graveyard to be a little different then keep reading. These aren’t the only way you can create a cool Halloween graveyard fence for your own cemetery however, another option is to simply use an old fence or even a picket fence. Using a picket fence around the area you can add different things to the fence like drops of blood, bits of flesh or a couple of ravens which transforms an ordinary picket fence into a scary ‘what kind of horrors lurk behind it’ kind of fence. Another option is to use old fence palings that are rotted and falling down to create the effect of an old abandoned graveyard lurking behind. What is a graveyard or cemetery without gravestones. Of course you could forgo gravestones for a few wooden crosses, you could even make them crude handmade wooden crosses with names carved in them and create the illusion of an old abandoned ghost town from the old black and white western movies. If you want to go for that look then you could even put an old frayed noose over a tree as well. Once you’ve decided on the tombstones you have to decide on what else you’re going to add to your graveyard and this is where you can really stand out from the crowd. Deciding on what props to add to your graveyard will help pull everything together and there are lots of options you can choose from including spooky Halloween trees – you can get some that are motion activated to make noises that will heighten visitors’ fears. You could go down the ghost route, after all where better to see a ghost than a graveyard? Then again you could do the whole ‘rise of the dead’ theme instead. This theme can be a lot of fun and there are some great props available for you to really make this the best halloween graveyard. Another option is just to leave it as a graveyard and simply have a bat or two hanging from the tree, people will be on edge expecting more leaving it as a graveyard with the odd bat and maybe some fog (I do love using a fog machine on Halloween) will keep them on edge without needing to add anything else. Of course if you emerge as the creepy cemetery caretaker from behind a tree it will make them jump as well!